Lake Macquarie City Council initiated the Sustainable Neighbourhoods program in 2008 to empower residents to act on local environmental and sustainability issues. The program has established a network of active, skilled and supported citizens who make a meaningful contribution to local community life and address local sustainability challenges. After 8 years of the development and implementation of the program, Council staff and the Sustainable Neighbourhood network have reviewed the program to evaluate progress and achievements, and to provide information to inform strategic planning for the future of the Sustainable Neighbourhood network. 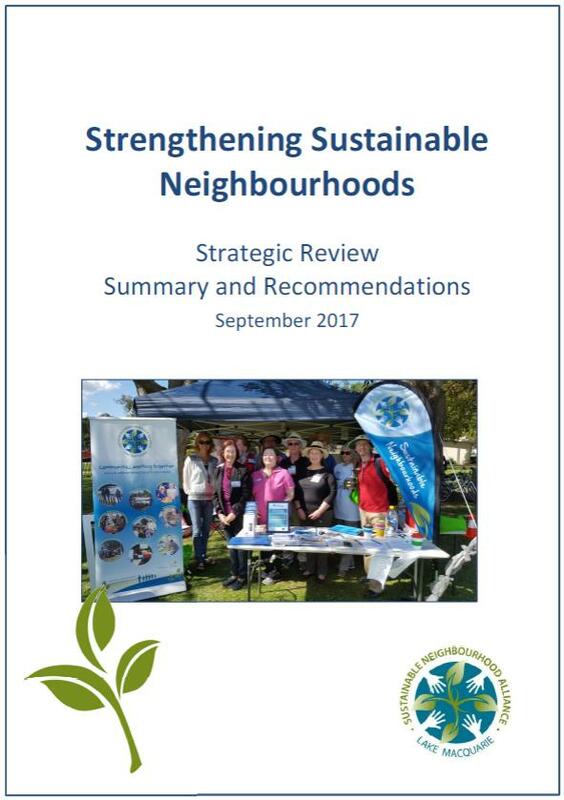 This report summarises the review and makes recommendations for consideration in strategic planning and future Sustainable Neighbourhood activities. Increase the reach and impact of Sustainable Neighbourhoods in the wider community. Prioritise actions to increase and improve promotion, advertising, marketing and media efforts. Increase recruiting efforts to attract more volunteers, including more young people, to actively participate, generate ideas, and help organise events and projects. Succession planning for Alliance Board members and local committee members should also be improved. Decrease the complexity and number of barriers and bureaucracy, including improved communication, timeliness and responsiveness when dealing with Council, and increase interaction between Sustainable Neighbourhood groups and Council staff more generally. Increase resources available to support Sustainable Neighbourhood groups and their projects, including paid staff and financial resources. Create more opportunity for capacity building, training, and personal growth of volunteers, including Alliance Board members. Create more opportunities to collaborate and coordinate among local groups, and to increase interaction between the Alliance Board and local groups and volunteers. Increase input from relevant Council staff during initial group development to help ensure each group’s aspirations and expectations are realistic. Support the Sustainable Neighbourhood Alliance and network to ensure they can operate effectively in the long term. Review the Sustainable Neighbourhoods program and current status of the Alliance and network. Assist with the development of an Alliance Strategic Plan incorporating a Business Plan, including contingencies to address potential for changes in future Council support. Provide a baseline of current status. Provide direction for Alliance board and identify priorities for strategic planning. Identify how the Alliance can best support the Sustainable Neighbourhood network. Identify how Council can best support the Alliance and the network. Promote cohesiveness between local Sustainable Neighbourhood groups and the Alliance. Strengthen and build capacity of volunteers and groups. Identify and evaluate impact of Sustainable Neighbourhood program so far. Back in August - September, we surveyed our network of Sustainable Neighbourhood volunteers. Between August - October 2016, a Council staff member and one or more Alliance Board Members attended each of the local Sustainable Neighbourhood Group meetings to discuss what was working well, and what can be done better. The results of these visits are detailed in the report below. 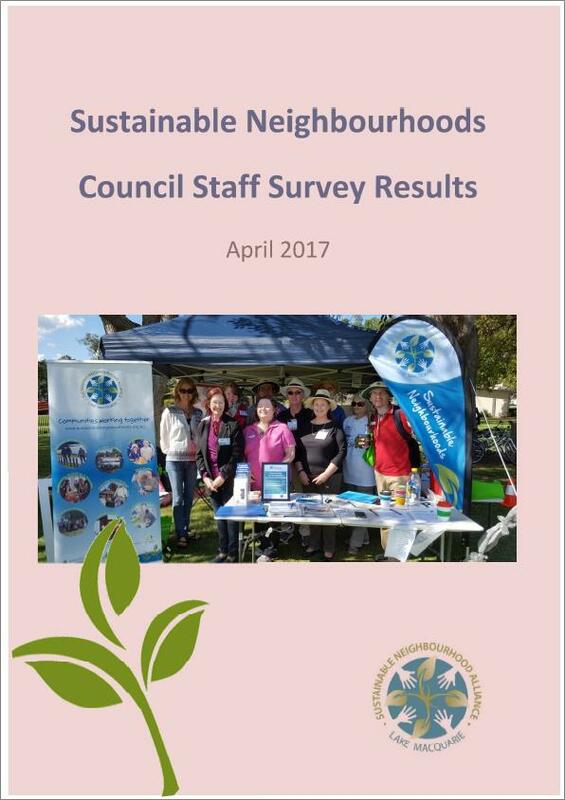 In April 2017, a selected number of Council staff were invited to complete a survey about their experiences in working with Sustainable Neighbourhood Groups. The results of these surveys are detailed in this report. Participants at five Sustainable Neighbourhood events between August 2016 and May 2017 were surveyed. The surveys targeted people who were attending a Sustainable Neighbourhood event for the first time. This report summarises the results of these surveys.